Les’ Copaque Production Sdn. Bhd, the creator and producer of the highly acclaimed Malaysian animation television series Upin & Ipin has signed a memorandum of understanding with MGV Industries Sdn. Bhd, a soft drink manufacturer. Under the memorandum of understanding, the two companies will produce chocolate malt-flavoured drink under the Upin & Ipin brand to be sold in Malaysia and Indonesia starting August 2016. The three-year contract is valued at RM44.36 million (USD11 million). Children will be the key target of the new drink. 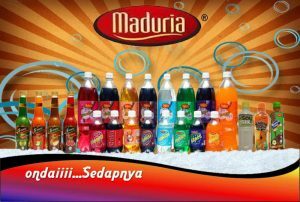 The main products of MGV Industries are Maduria carbonated soft drinks, Maduria isotonic drinks, Frutela fruit flavoured soft drinks and S-Sotic sparkling fruit juice. Apart from Upin & Ipin chocolate malt-flavoured drink, the companies will produce isotonic drinks under the Upin & Ipin brand as well as juices. If this is an isotonic drink for children, it will be the first of its kind in the country. 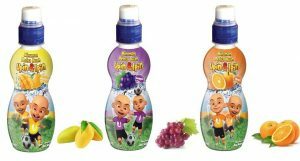 There are already existing Upin & Ipin juices in the market. The juices are made by Cozzo Food Industries Sdn Bhd for UI Trading Sdn Bhd, a unit of Les’ Copaque Sdn Bhd. It is not know if the new MoU with MGV Industries will affect the current cooperation with Cozzo Food Industries. The beverages will strengthen the existing lineup of Upin & Ipin branded merchandises ranging from bags to toys. The website http://www.upinipinstore.com has a complete list of Upin & Ipin products. 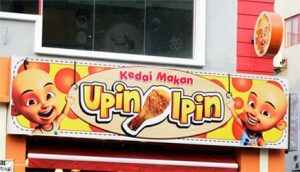 Upin & Ipin has also branched out into foodservice. The network of Upin & Ipin food outlets in the country has now grown to 15. The new Upin & Ipin chocolate malt-flavoured drink will come head on with BoBoiBoy Koko, an existing powdered chocolate malt-flavoured drink based on the BoBoiBoy cartoon franchise. Both BoBoiBoy and Upin & Ipin are highly successful local animations, locally and abroad with a strong following in Indonesia. 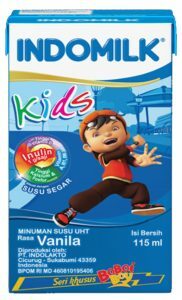 At the moment, Upin & Ipin packaged food is concentrated on fruit drink, while BoBoiBoy is into powdered chocolate malt-flavoured drink. 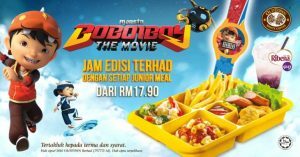 With Upin & Ipin moving into soft drinks, this may spur the owner of BoBoiBoy to start thinking of how to leverage the brand to come up with more packaged food products for its fans in Malaysia. In Indonesia, one of the largest milk producers Indomilk, has featured BoBoiBoy on its milk as part of the launch of BoBoiBoy The Movie in 2016. The strength of the Malaysian animated industry is astounding. 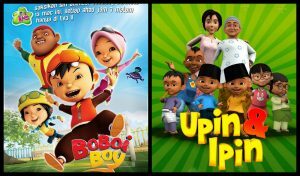 BoBoiBoy and Upin & Ipin have made it regionally. 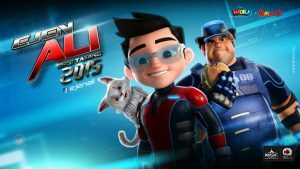 Other local animations include Ejen Ali, Rimba Racer, Origanimals and SuperSquad can potentially become the next to grace the packaging of food and drinks. In fact, Forceone Global has licensed the characters from ‘Super Squad’ on its own brand of mineral water. 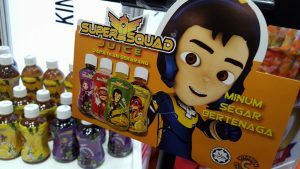 Kincirmas Sdn Bhd has launched a range of fruit flavoured drinks for children based on the SuperSquare animated TV series in November 2015. The SuperSquad flavoured juice range included mango, ice lemon tea, blackcurrant and lychee. PS Food and Beverage soft launched Ummi Origina at MIHAS 2016. The product features Ummi, a character in the Ummi Tales of Wisdom animation by Hud Hud Media Sdn Bhd. The product is oriented towards the Muslim market as it features a woman in the Muslim attire. The children’s drink market is currently ripe for the taking. It will not be surprise to see more local food and drinks companies embracing local animation characters to target the children market going forward. Previous articleWhat can you buy with RM 1.00 nowadays in Malaysia?